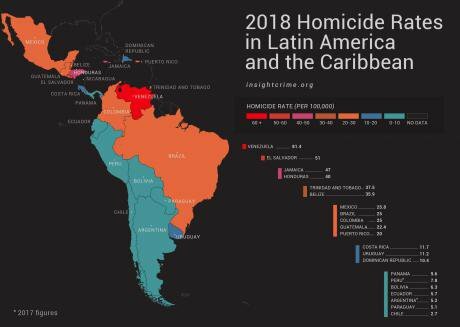 Map of 2018 homicide rates in Latin America and the Caribbean. Source: InSight Crime. All rights reserved. In its Homicide Round-Up, InSight Crime looks into the murder rates country by country and the factors behind them. But this drop might not be cause for optimism, as it is based on 2011 population figures and does not take into account the massive migration of an estimated three million Venezuelans fleeing crisis. The OVV also found that this supposed reduction in homicides contrasts with a sharp increase in killings by security forces — 7,523 victims in 2018 as opposed to 5,535 in 2017 — accounting for an astounding 32 percent of all homicides. While the government has not published official crime statistics for 2018, InSight Crime had access to a leaked document from the Venezuelan Observatory for Public Security, a department within the Interior Ministry. This spoke of an official rate of 10,573 homicides in 2018, or just 33 per 100,000 people, showing that the government does not include cases of “resisting authority” or other categories, such as victims of stray bullets. El Salvador logged 3,340 homicides in 2018, a 15 percent drop from 2017. The resulting homicide rate of 51 per 100,000 people continues the downward trend seen in El Salvador in recent years. As recently as 2016, the country topped InSight Crime’s regional rankings with an alarming rate of 81.2 per 100,000. In 2017, the rate dropped by 20 homicides per 100,000, but the country remained second on the list, only behind Venezuela. El Salvador’s homicide rate has long been linked to its two dominant and deadly gangs: the Mara Salvatrucha (MS13) and the Barrio 18. Though there may be a number of causes for the reduction in killings, such as the gangs forgoing internecine wars, the government has claimed its “mano dura,” or what are euphemistically termed “medidas extraordinarias” (extraordinary measures) now, was largely responsible. That same crackdown, however, explains a United Nations report that found extrajudicial killings were on the rise and likely to go unpunished. During the first two weeks of the new year, 126 people were murdered. Police officials blamed the gangs for the bloodshed, accusing them of a show of force ahead of presidential elections on February 3. In an address to the House of Representatives, Jamaica’s Prime Minister Andrew Holness said homicides decreased by 21.9 percentlast year. The country recorded 1,287 murders in 2018 for a homicide rate of 47 per 100,000 people. The police have attributed this improvement to the creation of Zones of Special Operation (ZOSO), areas in which the military joins in policing efforts. As part of his plan to bring the murder rate to 16 per 100,000 over the next decade, Holness has advocated for 20 more special security zones to be designated in 2019. Last year’s drop in homicides, however, comes after a near 20 percent rise in killings in 2017, which was linked to the poor rolloutof the ZOSO plan and similar security crackdowns. Between January to November 2018, Honduras saw 3,310 murders, according to the Observatory of Violence at the National Autonomous University of Honduras (Universidad Nacional Autónoma de Honduras – UNAH). This would point to a homicide rate of 40 per 100,000 people, a minor decrease from the 42.8 per 100,000 registered in 2017, when there were 3,791 murders. After hitting a high of 85.5 murders per 100,000 people in 2011, Honduras’ murder rate was cut in half by 2017. As in neighboring El Salvador, security officials attributed the downward trend to a government crackdown against drug traffickers and gangs. But officials have also blamed limited year-over-year reductions in the homicide rate on the very same security strategy, saying it leads to retaliation by criminal groups. In the first two weeks of 2019, 30 people were murdered in eight separate massacres, showing that the regular cocktail of gang violence, high levels of impunity and corruption continue. The year proved to be the second deadliest in the country’s history with 516 homicides, behind only 2008 when 550 people were killed. Despite its relatively small population of 1.3 million people, Trinidad and Tobago has seen violence grow steadily worse in recent years. Impunity continues to be a major challenge, as the Caribbean nation’s police officials have admitted that at least 83 percent of the murder cases from last year remain unsolved. Despite being the smallest country in Central America, Belize has faced a stubbornly high homicide rate. While official stats have yet to come out, local media tallied 143 murders in 2018, just two less than in 2012, the country’s most violent year. The government has denied that Belize is a staging base for criminal groups such as the Zetas and Jalisco Cartel – New Generation (Cartel Jalisco Nueva Generación – CJNG) from Mexico, or the MS13 from Guatemala, Honduras, and El Salvador. However, a persistently high homicide rate shows that while Belize may have stayed out of the headlines, organized crime appears to be a major threat. Enrique Peña Nieto’s tenure as Mexico’s president ended with homicides at a record high. In 2018, the country logged 33,341 murders, up from 31,174 in 2017, according to data from the National System of Public Security. This brings the murder rate to 25.8 per 100,000 up from 22.5 in 2017 and 16.2 in 2016. The spike in homicides has been spurred by the continued fragmentation of larger cartels, and the government’s inability to react to the less organized, smaller gangs, which kill for control of territory. The new president, Andrés Manuel López Obrador, has reversed his security plans, advocating for the creation of a national guard and keeping the military in the streets to try and stem the bloodshed after an average of 91 people were killed per day last year. 2017 marked a sad record for Brazil: 175 people were killed every day. Last year saw slight improvement, with 39,183 murdersbetween January and September, down from 44,733 killings in the same period in 2017, according to the Brazilian Public SecurityForum (Fórum Brasileiro de Segurança Pública). If this reduction held, it would bring the murder rate to 25 per 100,000 people for the year. But insecurity and violence continue to be top concerns for much of the population, as Brazil struggles to find effective ways to stop violent crime. The army was sent in to Rio de Janeiro in 2017, the latest example of a militarization strategy that has consistently failedin Latin America. Jair Bolsonaro was propelled to the presidency largely by pledging to allow police to shoot criminals and to simplify gun ownership laws. So far in 2019, criminal groups have unleashed an assault on the state of Ceará, and the government has responded to the violence with federal troops, turning northeastern Brazil into a battle zone. Such outright conflict may add to the body count, meaning Brazil will be unable to address the root causes of its consistently high murder rate. After seeing its lowest level of violence in 42 years in 2017, Colombia saw a small resurgence of violence in 2018, increasing to 12,311 homicides from 11,381 in 2017. This four percent rise takes the homicide rate to 25 per 100,000 people, up from 24 last year. In 2018, Colombia saw an increase and diversification of criminal groups in Colombia, including former members of the Revolutionary Armed Forces of Colombia (Fuerzas Armadas Revolucionarias de Colombia – FARC), who have gathered into ex-FARC Mafia groups that are growing in strength, as well as members of the National Liberation Army (Ejército de Liberación Nacional – ELN). The increasing number of FARC dissidents abandoning the peace process and the breakdown in talks with the ELN have emboldened these organizations. Furthermore, violence has risen along the border with Venezuela while social leaders have been killed as a result of fighting over control of illicit crops and land. Guatemala continued to show marked improvements in its homicide rate, ending the year at 22.4 per 100,000 people. The country recorded 3,881 killings in 2018, down from 4,409 murders and a homicide rate of 26.1 in 2017, according to government officials. But civil society figures tell a different story. The Mutual Support Group (Grupo de Apoyo Mutuo – GAM), a non-governmental organization which tracks crime in the country, said the official tally was short by over 1,000 homicides, placing the total at 4,914 and the murder rate at 28 per 100,000. Either way, Guatemala remains less plagued with violence than its Northern Triangle neighbors in Honduras and El Salvador. The findings of InSight Crime’s 2017 investigation into homicides in Guatemala remain valid. President Jimmy Morales’ war with the anti-corruption body known as the International Commission Against Impunity in Guatemala (Comisión Internacional Contra la Impunidad en Guatemala – CICIG) has left little room for the government to improve on rampant impunity for murders and faulty data-gathering about such crimes. Puerto Rico saw its murder rate remain at 20 per 100,000 people in 2018, about four times that of the mainland United States. Records show that 641 people were killed last year, a dip from the 710 murders in 2017, and far below the record 1,164 homicides in 2011. Local drug gangs are largely to blame for the body count, with the US Drug Enforcement Administration (DEA) saying some 60 percent of homicides there are drug-related. This year, Puerto Rico has already seen a wave of killings, worrying residents and federal law enforcement. A police force struggling to maintain its ranks, as well as solve crimes, will only fuel insecurity on the island. With just 17 fewer homicides in 2018, Costa Rica saw its homicide rate remain relatively stable. The Central American country counted 586 murders, dropping the murder rate slightly from 12.1 to 11.7 per 100,000 people. Until last year’s drop, the homicide rate had steadily increased since 2012. The country’s Judicial Investigation Agency (Organismo de Investigación Judicial – OIJ) had even predicted the same for 2018. Traditionally one of Central America’s more peaceful nations, the country has suffered from rising levels of crime recently, thanks to its position as a key transit point for Colombian cocaine. The government has struggled to respond to an increase in available drugs, which has led to groups fighting for control of local markets. Uruguay recorded a record high 382 murders in 2018. With 99 more homicides than in 2017, this marked a brutal year-over-year increase of 35 percent and a homicide rate of 11.2 per 100,000 people. These statistics are drawn from the Propuestas Foundation (Fundapro), linked to the opposition Colorado Party. Official figures have only been released for the first half of the year, showing 218 murders, as compared to 131 from January-June 2017. For one of the traditionally more peaceful and stable countries in the region, this sudden rise is alarming. Authorities are convinced fighting between organized crime groups is to blame. However, this may provide a convenient scapegoat to justify a militarized response when other problems, such as lackluster resolution and conviction rates for homicides, may also have contributed to the situation. The Citizen Security Observatory reported that 801 murders were registered in the Caribbean nation during the first nine months of 2018, a drop of 145 when compared to the 946 homicides registered for the same period in 2017. Although this shows a continued downward trend that has lasted since 2011, a recent poll shows that public insecurity remains a top concern for the Dominican population. In December, Panama’s Public Ministry released a report showing that there were 401 murders between January and November of 2018, about a dozen fewer than the 378 deaths in 2017. At this count, the homicide rate sits at 9.6 per 100,000 people. The report highlighted that more than 40 percent (169) of the incidents occurred in the capital, Panama City. National Police Director Alonso Vega Pino says that the slight increase is “directly related to organized crime.” Panama’s geography makes it a vital transit point for illegal trade in the region. An internal investigation into an international arms trafficking network in October 2018 illustrated the country’s ongoing challenges with confronting corruption and organized crime. In 2017, Peru registered 2,487 murders, slightly up from the 2,435 in 2016, for a homicide rate of 7.8 per 100,000. No data is available for 2018 so far. The country has maintained relatively low levels of violent crime in recent decades, though institutionalized corruption is threatening resources dedicated to fighting Peru’s ongoing drug trafficking challenges. During a televised news conference, Bolivia’s Interior Minister Carlos Romero announced that the country had registered a homicide rate of 6.3 per 100,000 people in 2018, a more than two percent improvement compared to the first half of 2017, when the country recorded a rate of 8.5 per 100,000. The announcement comes as the country prepares for primary presidential elections on January 27. In the past year, opposition groups who firmly reject Evo Morales decision to run for a fourth consecutive term have conducted mass demonstrations and national strikes. The presidential elections, which will take place in October, are likely to take the focus away from national security issues at a time when Brazil’s gangs are moving into the South American nation. Ecuador saw 975 murders in 2018, 18 more than the 957 recorded in 2017, giving the country a homicide rate of 5.7 per 100,000 people, according to figures from the national police. Less than a decade ago, Ecuador faced murder rates three times as high, but a process of so-called “gang legalization” has helped drastically reduce killings. However, an increase in drug trafficking from Colombia to Ecuador has renewed concerns about violence. The high-profile killing of three journalists by an ex-FARC mafia group has also made cross-border security a priority for the government. In the midst of a deep economic crisis, Argentina continues to have one of the lowest homicide rates on the continent. Argentina recorded a homicide rate of 5.2 per 100,000 people in 2017, a slight decrease from 6.6 in 2015, according to Security Ministry figures. No data was available for 2018 so far. Low levels of violence, however, haven’t translated into security. In December, Security Minister Patricia Bullrich signed a decree giving federal forces greater use of deadly force. The measure, expected to be implemented six months from now, is already creating controversy and uncertainty within the Argentine population. The latest homicide report by Paraguay’s National Observatory of Security and Citizen Coexistence indicates that a total of 350 murders were recorded between January and September of 2018. This statistic yields a murder rate of 5.1 per 100,000, considerably lower than the homicide rate of 7.8 recorded in 2017. However, Interior Minister Juan Ernesto Villamayor recently stated in a radio interview that the country must reevaluate its transnational strategies with Argentina and Brazil to combat organized crime in the region. The First Capital Command (Primeiro Comando da Capital – PCC), Brazil’s most powerful gang, continues to threaten the country’s security. Chile continues its reign as the country with the lowest homicide rate in Latin America. From January to October 2018, a total of 488 killings were recorded, accounting for a homicide rate of 2.7 per 100,000 people. This is even lower than the country’s homicide rate of 3.3 that was registered for the same period of time in 2017. Even with low levels of homicides, Chile has seen random acts of violence. An explosive artifact, for example, was detonated at a local bus stop in the capital city of Santiago, resulting in multiple injuries. With organized crime expected to strengthen in 2019, it remains to be seen if Chile can continue to uphold its low levels of violence. In 2017, Nicaragua registered a homicide rate of 7 per 100,000 people, with 431 total murders, continuing a positive trend of lower violence seen over several years. However, levels of violence soared in 2018 due to the brutal repression of civilian protesters by the regime of President Daniel Ortega. Incomplete statistics of killings have been provided by civil society and non-governmental organizations. The Nicaraguan Association for Human Rights (Asociación Nicaragüense Pro Derechos Humanos – ANDPH) recorded in July that at least 448 had been killed and 595 people disappeared. Further information from the group has not been issued since it closed its offices in Nicaragua in August due to consistent government threats. * Murder rates calculated by InSight Crime based on partial homicide data for 2018 and the country’s 2017 estimated population total, according to the Population Reference Bureau. These will be updated as full 2018 figures become available. This article was previously published in InSight Crime. You can read the original here.